The AaquaBlaster 360 portable barrel and tank washing system is ideal for applications where the insertion opening is smaller than two inches such as wine barrels and closed head 55 gallon drums. The cleaning efficiency of the “360” is achieved thanks to two or four stream jets at low flow rate but high pressure, thus providing high impact washing. 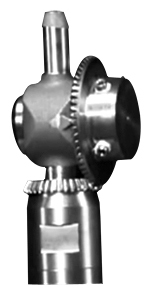 Stream nozzles rotate around a turret to provide complete orbital cleaning coverage of all interior surfaces. The “360” incorporates a plate at the base that stabilizes and protects the cleaning device during and after insertion. The “360” allows for easy insertion is achieved into wine barrels mounted on most Western Square or TOPCO type barrel pallets and can be incorporated into the Western Square barrel cleaning platform that contains rollers for easy rotation. 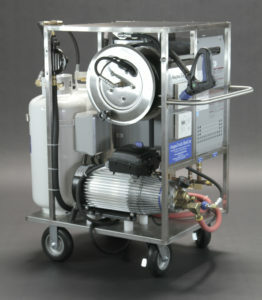 AaquaBlaster’s are driven by hot or cold high pressure washers producing 4 GPM of flow or more. The higher the flow the faster the rotation of the nozzles thus producing a more rapid cleaning cycle. High pressure inline Y filters are recommended and available to prevent particulates from interrupting the internal gears.